Beautiful Christening apparel for boys from Little Things Mean A Lot, in dupioni silk & basic cotton. Traditional cathedral length family gowns and rompers in sizes preemie to 24 months. 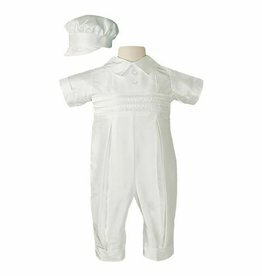 Many styles are hand-made in the U.S.A.
Little Things Mean A Lot Dupioni Silk Christening Coverall and Hat for baby boys ages 0-3m to 6-12m. Pintucking and button detail gives it a handsome look.